"Attack the Light" makes 'Best of 2015' lists, plus Apple TV version coming soon! 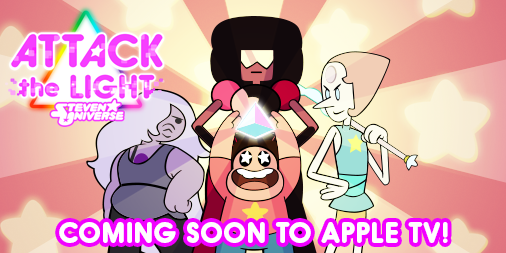 "Attack the Light", our Steven Universe RPG for mobile devices, made its way onto several Best of 2015 lists! Destructoid chose ATL as one of their five nominees for "Best Mobile Game of 2015"! Popular Mechanics selected it as one of their "Ten Best RPG Games of 2015"! Paste Magazine named it as one of their "Ten Best Mobile games of 2015!" 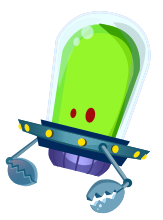 And finally, Google included Attack the Light on their Best Android Games of 2015 list! Our team is humbled and honored to receive such wonderful recognition. Always a nice way to start the new year! Attack the Light is coming very soon to the new Apple TV!! Featuring glorious HD graphics, re-designed controls created specifically for the Apple TV remote AND new gamepad controls supporting all MFI controllers! Also added to this version: DIAMOND MODE – an all new harder difficulty setting that makes enemies much meaner and also hides all bonus tap stars! And finally: owners of the iOS version will be able to download the TV version for free! Hope you’ll look forward to it!